The first significant new office building at King’s Cross Central within the Allies and Morrison/Porphyrios Associates-designed masterplan, has had the design and other reserved matters details approved by London Borough of Camden. Designed by Allies and Morrison the building is earmarked for Sainsbury’s to house its new sustainable Store Support Centre. The anticipated construction cost for the base build will be approximately £100m. Located to the north of the former Eastern Goods Yard buildings which are being converted into a new home for the University of the Arts, London by Stanton Williams, the new 570,000 sq.ft (gross area) building will also provide a mix of retail, small business units, gymnasium, Sainsbury’s food, and cooking research and demonstration suites. The building may also accommodate an ‘exploratory centre’, where visitors can explore issues relating to education, sustainability and building, to facilitate links between local schools, higher education and employers. 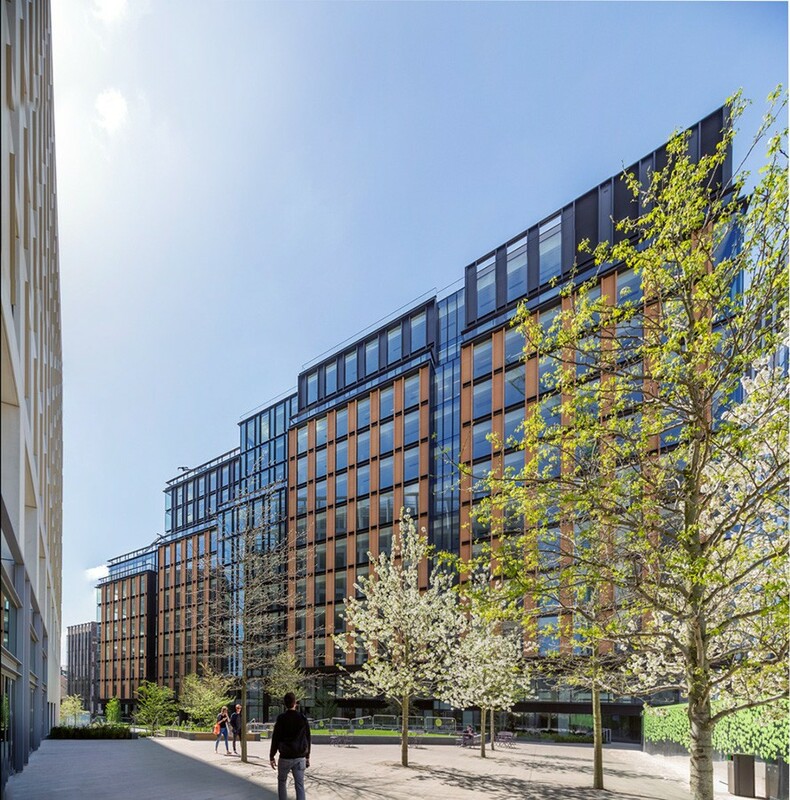 Responding to the client and tenant brief, Allies and Morrison has through a carefully considered design approach created a building with outstanding ‘green’ credentials. Achieving a BREEAM ‘excellent’ rating, it will deliver an overall carbon saving of 41% below Building Regulations Part L (2006) and will set new national benchmarks for environmental performance. Allies and Morrison’s proposals include half an acre of roof gardens with a rich mix of trees, grasses, herbs, and crop planting to create a unique rooftop for the building’s occupants, passers-by and neighbours. The planting will encourage wildlife of many kinds to this urban setting. The robust and warehouse-like building envelope is tailored to reduce solar gain and maximise daylighting. The structure is used to absorb and redistribute warm and cold temperatures to reduce energy usage. Benefitting from a site wide CHP, heat created from power generation is combined with absorption technology to generate cooling. Significantly reducing water consumption, rainwater is harvested and grey water recycled for toilet flushing and irrigation. The design of the building recognises the strong warehouses and transit sheds that form the character of the area. Allies and Morrison’s proposal incorporates a material palette of robust brick columns and concrete beams with deep reveals. Metalwork is kept to a minimum in the form of simple punched metal fins and recessed spandrel panels, not dominating the overall form. The mass and detail of the building shade the internal spaces from the sun, keeping it cool in the summer and warm in the winter. The base and the top of the building are designed to be appropriate to the scale and form of the building providing a strong street presence at lower levels with big masonry columns coming to ground with bays of active frontage all around the building. The massing of the building at upper levels has been developed to lock the building into the context of the surrounding masterplan and the Eastern Goods Yard, making it an integrated part of the townscape. Strong loggias or ‘bell towers’ create a beautiful top to the building with modelling and form adding interest and delight in the wider townscape setting. Outline planning consent was granted for the regeneration at Kings Cross in December 2006. Construction on the building is due to start in May and the scheme is due for completion early 2012. King’s Cross Central (www.argentkingscross.com) is one of the most significant development and regeneration opportunities in central London. Planning permission is for a high density development of nearly 8 million sq ft. The permission includes up to 2,000 new homes, 20 new streets, 10 new major public spaces and the restoration of 20 historic buildings and structures which are to be retained and refurbished.